The irregular shoreline of Leleiwi Beach Park consists of a series of natural ponds, inlets, and coves fronted in part by a handful of small rock islets. Park improvements along KalanianaLole Avenue include eight picnic pavilions constructed in 1970 as a joint effort of the Lions Club and the county, as well as showers, restrooms, paved walkways, and several parking lots. The county also provides lifeguard service. Within the eastern portion of the park is the Richardson Ocean Center, an outdoor recreation and interpretive center that was developed cooperatively by the Hawaii County parks department, the University of Hawaii Sea Grant Extension Service, and the state's Department of Planning and Economic Development. The building housing the center, formerly the home of Elsa and George Richardson, was acquired by the county along with the lands surrounding it for use as a park. Richardson Ocean Center not only quarters the Sea Grant program personnel, but also provides a marine education center and display area open to the general public and special interest groups. Although most beach-goers today know the area surrounding the ocean center simply as Richardson's, many kamaʻaina families still recall that the Richardson estate was also the home of the Malo family, Originally from ʻOpihikao in the district of Puna, the first Malo family member to take up residence on the land was Kauikoaʻole, who moved into the area during the late 1800s. Kauikoaʻole's wife bore him two children, a boy and a girl, and he named his son David Malolauliioliloanaipualoha. David shortened his last name to Malo as a result of a night dream-a phenomenon common among family members-in which David was instructed to drop all of the components of his Hawaiian name except Malo for common use. Malo thus became the family name for the generations that followed, and the now widely extended family still acknowledges David as their patriarch. David Malo and his wife Elena made their home on his father's shoreline property, which they knew as Leleiwi. The first of their seven children, all of whom were born on the land, came in 1907. He was named John David Malo. Each succeeding male child was also given the middle name David, a tradition to which some lines of the family still adhere. Life proceeded peacefully for the Malos until 1920 when the entire family was stricken with typhoid fever. Elena, the least severely afflicted of them all, walked to the home of George Richardson on Reeds Bay to seek help. Richardson, a part-Hawaiian originally from Kohala, regularly fished up and down the Keaukaha coastline in his boat and had become a close friend of David Malo's. When Elena showed up on his doorstep with the terrible news, he immediately put her on board his boat, the fastest means of transportation then available, and returned to the Malo home. There he gathered up the rest of the family and headed for Hilo and the hospital. In spite of these valiant efforts, two of the children died. After the family returned home to convalesce, Richardson continued to look in on them and see to their welfare by bringing medicine and other necessities. Malo felt deeply indebted to Richardson, believing that without his help he might have lost his entire family. When he was fully recovered, Malo suggested that Richardson build a home on the Malo property if he wished and that he consider the land as his own. Richardson accepted the offer and in the early 1920s constructed a large house on the property that is now the Richardson Ocean Center. Malo helped design the structure, recommending the large doors at the front and back of the house to provide a corridor for the periodic inundations by high winter surf and tsunami. This plan did actually save the building on a number of occasions when the ocean flooded through the house rather than carrying it away. By the early 1930s, after both Elena and David Malo had died, the remaining children moved in with their oldest brother, John, who was married and living on homestead land in Keaukaha. At that time George Richardson, his wife Elsa, and their three sons became the sole permanent residents on the estate. 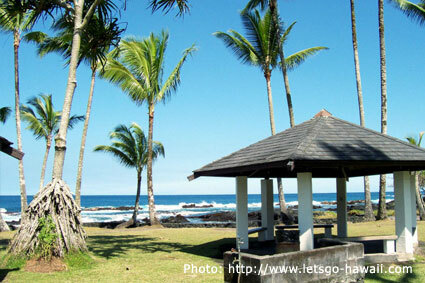 After some years, however, the Richardsons moved away and the property eventually became part of Leleiwi Beach Park. The many aquatic activities for which the beach park is used include swimming, snorkeling, throw-netting, bodyboarding, and surfing. At Kaumaui, where the three westernmost pavilions are located, the shoreline is exposed directly to the open ocean and to strong alongshore currents. Most families with children, therefore, congregate around the protected inlets at Waiʻolena in the center of the park or in the sheltered bay bordering Richardson Ocean Center. Although its surface water is cold because of profuse fresh water intrusion, the bay is home for a wide variety of fish and other marine life. This feature, combined with shallow, nearly current-free waters in the lee of outer point, have made the bay the most popular snorkeling area on the Hilo side of the island. Beyond the protection of the point, surfers and bodyboarders ride the break they call "Richardson's," where rip currents are common during periods of high surf. A sea wall fronts much of the bay's shoreline, but a tiny pocket beach at the base of the wall offers an excellent entry and exit point for all in-water activities and a limited area for sunbathing. Sunbathers also utilize an open area of the park behind the sea wall and near the beach.